I recently visited the Disney Springs Good Neighbor hotels that participate in Disney World resort benefits like Extra Magic Hours and the ability to book FastPass+ reservations 60 days prior to arrival and thought you’d be interested to know about the three character breakfast locations available on select days. It is important to note that these character breakfasts do not take place at restaurants within Disney Springs itself but are located in nearby Disney Springs Resort Area hotels, all within walking distance of Disney Springs. None of these locations accept advance reservations and are a great option if you’re having trouble getting reservations at a character meal location found in the Disney reservation system. You do not have to be a guest of these hotels to dine at the restaurants. Which characters are offered: Disney sends over the characters and they usually just list “Disney Friends” or “Disney Pals” but Minnie Mouse, Pluto and Goofy seem to be fairly frequent visitors to breakfast. Brer Bear and Brer Fox were making the rounds the morning we were at Hilton Orlando Lake Buena Vista which I thought was neat because you don’t usually see those two outside of Frontierland in the Magic Kingdom. How to Get There: If you’re staying at one of the Disney Springs hotels, you can easily walk over. If you’re staying at one of the official Disney World resorts, the free option is to take the bus or boat, where available< from your hotel to the Disney Springs Marketplace stop and walk over. It may be easier to have a taxi, Uber or Lyft drop you off at the resort entrance. Lakeview Restaurant - this is the only character meal where we ate and I highly recommend it. The Lakeview restaurant is a very pleasant setting with a lovely view and the buffet was delicious with fresh fruit, breads and breakfast pastries, breakfast potatoes, bacon, ham, sausage, made-to-order omelets, and other tasty options. The children’s section delighted me because it included breakfast pizza and macaroni and cheese along with traditional breakfast items. The person at tending the station explained that children need a good breakfast and energy when they go to the theme parks so you have to provide options that they’ll want to eat. You can’t argue with that logic! Disney Dining Plans not accepted / MagicBands cannot be used for payment. Letterpress Restaurant – Letterpress is a bright and modern restaurant located on the lower level of the hotel’s main tower. Covington Mill Restaurant – restaurant has a charming country feel with a faux porch and rocking chairs at the entrance; the buffet menu includes Mickey Mouse waffles, made-to-order omelet station and a nice selection of other breakfast options like fruit, cearls, yogurt, fresh baked breads and more. 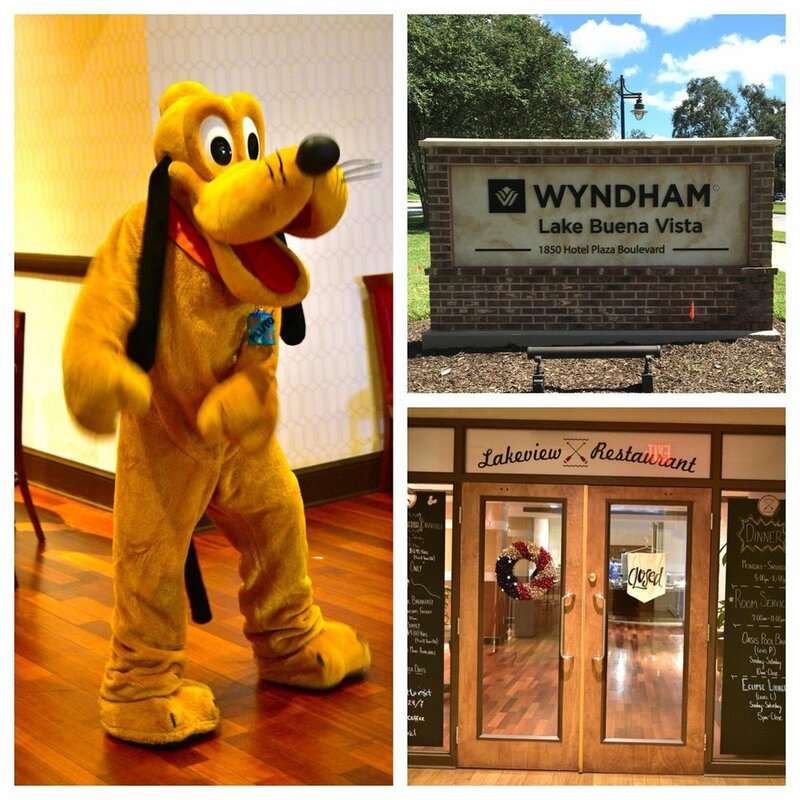 Character breakfasts offered on Tuesdays, Thursdays, and Saturdays at the Lakeview Restaurant in the Wyndham Lake Buena Vista Resort / Disney Springs Resort Area - Disney World. Sunday Character Breakfast at Letterpress restaurant in Disney Buena Vista Palace Resort / Disney Springs Resort Area - Disney World. Sunday character breakfast presented at Hilton Orlando Lake Buena Vista hotel / Disney Springs Resort Area - Disney World.